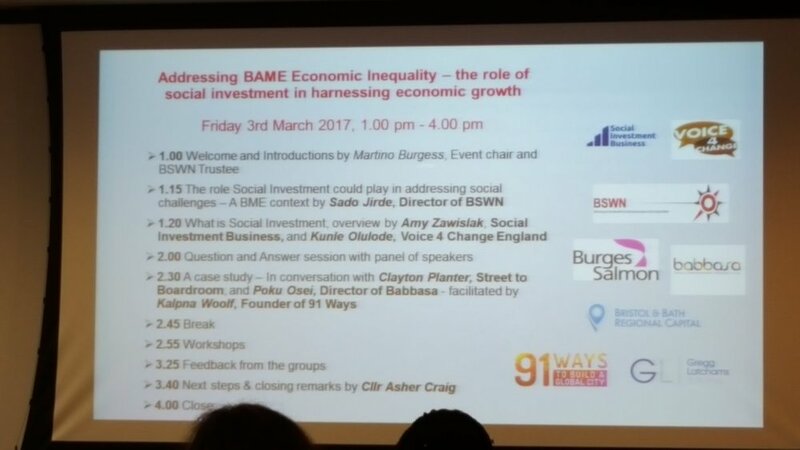 On the 3rd March 2017, Black South West Network (BSWN) together with Voice 4 Change England (V4CE), Social Investment Business (SIB) and the legal firm Burgess Salmon hosted a half day event to look at exploring the role of social investment across the BAME sector in Bristol, to address BAME economic inequality and the viability of this route for our communities. Ted Fowler, who made the introductions and outlined the purpose of the day, opened the event, followed by Sado Jirde, Director of Black South West Network. Sado highlighted the economic challenges faced by the BAME communities in the context of an economically thriving city. She further presented an Economic Development model being explored by BSWN, Babbasa and Bristol & Bath Regional Capital (BBRC). The model takes a collective impact approach way of working by stimulating economic activity within BAME communities, through an enterprise hub with a focus on enterprise/social enterprises and skills development. Kunle Olulode, Director of V4C, gave a national perspective and talked about the very real challenges and barriers that exist. This was followed by an input from Amy Zawislak from SIB, who outlined the opportunities available around Big Potential. This part of the day was concluded with a short Q&A. After a break, we looked at case studies of successful social enterprises running in Bristol and heard from Clayton Planter from Street to Boardroom and Poku Osei Director of Babbasa, which was facilitated by Kalpna Woolf, from 91 Ways to build a global city. 1. Based on what has been presented to you today, do you think there is or could be a possible demand for Social Investment in the Bristol BAME community? - Mainstream networks need to be engaged and tapped into i.e RSA, Merchants, etc. 2. What are the types of business/initiatives do you think can benefit from social investment in the BAME community, given the context of significant public sector cuts? - existing organisations facing cuts may benefit better than start ups - potential for a collective application consortia? 3. What infrastructure support do you think is needed to increase accessibility to Social Investment for Social Enterprises/Entrepreneurs operating within BAME communities? - What role does social value play in investment? 4. What other types of support do you think is needed in the BAME community to create thriving social enterprises/entrepreneurs and how do you envisage it being delivered successfully? The day concluded with closing remarks from Deputy Mayor and one of the original founders of V4CE, Cllr Asher Craig. In her speech, Cllr Craig was pleased that the discussion around social investment as an alternative funding model for BAME organisations and social entrepreneurs was finally initiated. She welcomed BSWN’s economic development model that was presented at the event, and was looking forward to seeing its progression and providing her support. Altogether approximately fifty people attended the half-day session.